Caltech CRM is pleased to bring to you our new free ebook – Big Data, Little Data – CRM. Its all about how to get more from your data using Microsoft Dynamics CRM. The ebook explains data types and how, fundamentally, it’s all critical data. 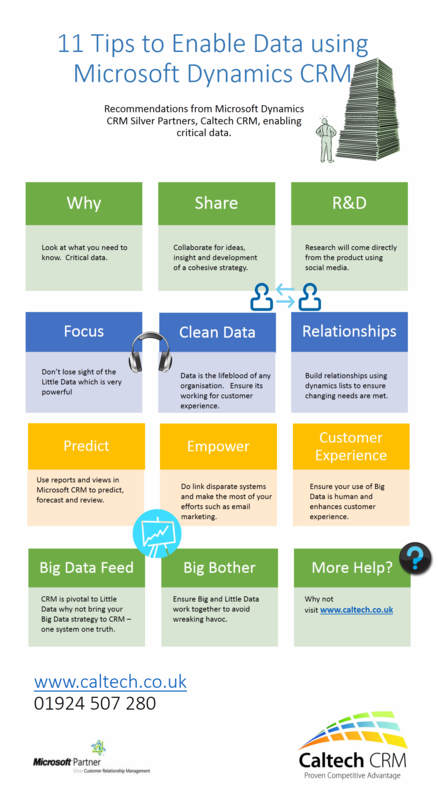 Caltech CRM offers 11 tips to get more from your data using Microsoft CRM to enable its use and success to your business. To read our new ebook click here. Caltech has also produced an easy to view infographic outlining the 11 tips. Join our data debate today! This entry was posted in CRM Strategy, Ebooks by Catherine. Bookmark the permalink.